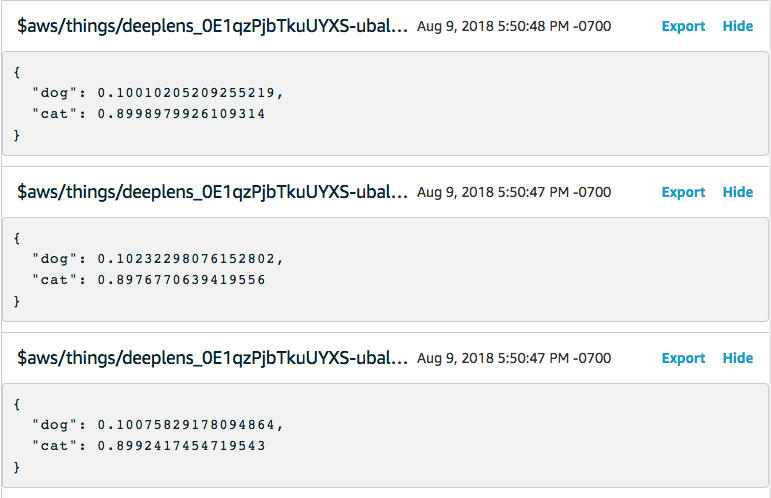 After a successful project deployment, your deployed AWS DeepLens project starts to run on your registered AWS DeepLens device. If the Lambda function of your project uses the AWS IoT Greengrass SDK (greengrasssdk) to publish text-based messages to AWS IoT, including JSON-formatted inference results as is done in all of the AWS DeepLens sample projects, you can view such project output using the AWS IoT Core console. If the inference Lambda function uses the OpenCV Library (cv2) module to output inference results as video feeds, you can view the video output using a web browser or connecting to the device directly a monitor, mouse and keyboard. However, viewing text-based project output is more economical to verify that your deployed project runs as expected. Open the AWS DeepLens console and make sure to choose the US N. Virginia region. From the AWS DeepLens primary navigation pane, choose Devices and then choose your AWS DeepLens project. From the Device details page of selected device, copy the MQTT topic value, of the $aws/things/deeplens_<uuid>/infer format. You will need to paste this AWS IoT topic ID in the AWS IoT console that you'll open next. Open the AWS Management Console for IoT Core and make sure to choose US North Virginia region. From the primary navigation pane, choose Test. Under Subscription topic on the MQTT client page, paste the AWS IoT topic ID (coped in Step 3 above) into the Subscription topic input field. Then, choose Subscribe to topic.